Tucked away, just outside the city of Huayin in the Shaanxi province of China lies Mount Hua Shan, sometime called the Yellow Mountain. Hua Shan translates directly to “Great Western Mountain.” And Great Western Mountain, in my opinion, is a complete understatement. This nearly insurmountable natural wonder is like nothing else. Not only was climbing it one of the most intense physical experiences I’ve ever had, it was also deeply spiritual. Many people take a guided tour but this is absolutely not necessary. The trails are well marked and easy to find and the views and sights need no explanation. Day 1: My friends and I set out at dawn to the base of the mountain. We took a tiny cable car to the top of the first peak, which we did not regret. We had the option to climb it but we were told the hike wasn’t as scenic as other treks higher up. So we opted for the lift and we were glad we did. We arrived at the top of the North Peak, the lowest peak. People walked all over looking at the incredible views. There were locks clipped all over with Chinese symbols engraved in them. Hundreds and hundreds of locks coated the chains marking the memories of visitors past. We hiked through the crowds to get to the real adventure. We were ready to climb: light hiking boots (men, women) and trekking socks, long sleeve shirts (men, women) and long pants (men, women)! We were well prepared carrying our relatively small backpacks (small, medium) containing thermal pants (men, women) and tops (men, women) for sleeping, a towel, sunscreen for body and face (if needed), water, nutritious snacks (various protein bars) and bug spray. A few more convenient things to have are a pair of hiking gloves, headlamp with extra batteries, portable charge (small, medium or large), first aid kit and blister bands and a hand sanitizer. Anything else would have just held us back. The hike is difficult so one should only carry what is absolutely necessary. In addition to the bare necessities, I would also suggest bringing a tiny metal lock. Don’t forget your camera and monopod and also go pro camera with chest or head mount might be useful for shooting. Not to lock up your belongings but to attach somewhere on the mountain. After securing the lock and making a wish, you keep the key and legend has it when your wish comes true, you’ll return to the Huashan Trail and reclaim the lock. I’m not sure I believe the legend but the key makes a great necklace charm and souvenir. We climbed endless flights of crooked stone steps as we moved further and further away from the crowds. We scaled the so-called “Stairway to Heaven,” a set of shallow stairs carved into the face of a cliff. The stairs were completely perpendicular to the ground and the only way to move up the face of the cliff was with the help of a chain hanging from the top. It seemed like this ladder would never end. Moving up just a few steps felt like miles and looking down was striking. We made it to the top and continued on. We hiked on and on, all day stopping occasionally for water, trail mix and Kodak moments along the trail. There are places to buy water and snacks at the beginning of the trail but these little stands disappear as you hike higher so stock up while you can. By evening, we were tired, disheveled and could barely go on. We had reached the East Peak and the famous chess pavilion. The chess pavilion is a tiny Taoist temple that sitting precariously on a throne of rocks. It sits below one of the most beautiful peaks of the mountain and is very difficult to reach. Seeing the chess pavilion was the greatest moment of my entire month in China. I felt both at peace and incredibly accomplished. We came upon a small rustic hostel, grateful for somewhere to lie down and elated that they had open beds. We paid for our bunk-bed rooms (which were less than $10 each) and they gave us linens. The linens consisted of about half of a terrycloth towel that we used to shower in the tiny bathhouse that only had cold water. We had dinner at the hostel. Even though the food we ate was rather plain and a bit pricey, it was one of the best meals I had during my stay in China. I was so thankful to be resting. I would advise bringing your own towel if not for bathing then as a mattress pad. The beds are extremely uncomfortable and Huangshan gets very cold at night. Carrying a blanket would add unnecessary extra weight to your pack so just bring a sweatshirt and long pants to sleep in. As the sun was setting, we explored the grounds around where we were staying. We found sights and beauty all around us. The silence was almost eerie and the stillness of everything was surreal. The clouds moved past us silently as we gazed, in awe, of how high up were really were. As the sun set we retreated to our squeaky beds and thin mattresses with our wet towels for blankets. Conditions were far from ideal but we passed out immediately. Day 2: We woke up just before sunrise, hoping to see the sun come up over the mountain peak. We bundled up in warm clothing and dragged our aching bodies to a small peak just a few hundred yards from our beds. We sat, freezing, on the stone peak, wind tearing through our thin layers of clothing, waiting. We waited and waited. The day grew brighter but we never saw the sun. The clouds covered up the whole sunrise. We welcomed the day in silence, almost wishing we had just slept a little more. Check the weather in advance and if it’s going to be even remotely cloudy, skip the sunrise and rest. Oppositely, if the sky is supposed to be clear push yourself to be there to see it. We continued the hike, seeking to reach the other 2 peaks by the end of the day. We trekked through brush and up more stone stairs. We crawled, hands and knees, up dusty paths, miserable, waiting for the trail to clear in front of us. Sometimes we feared we’d never make it. We considered turning back at least 3 times an hour. We were sweating, tears were shed and we abandoned some of our gear from our backpacks so we’d have less weight to carry. Throwing out our towels may have been a little irresponsible but ya gotta do what you gotta do sometimes. 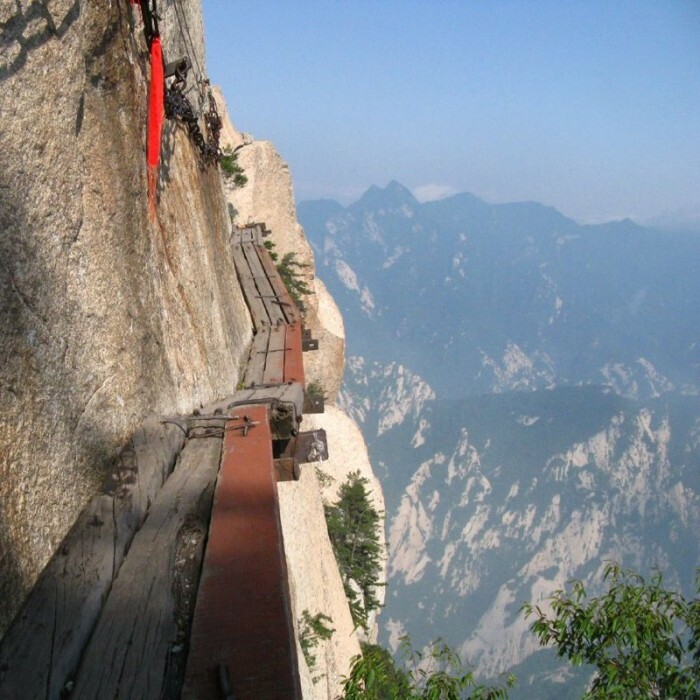 The Huashan hiking trail pushed us to the edge. We reached the south peak. All the pain was worth it; we reached the monarch peak of Hua Shan, the highest point. The views were spectacular. A rock stuck off the peak out over the valley. We tiptoed to the edge of the rock, looking out into our surroundings, hundreds of feet in the air. No one spoke as we took in the breathtaking views. We wished we could stay longer but we knew we needed to press on if we were going to make it back to the north peak before sunset. We kept moving and the trail got more treacherous. We arrived at a portion of the hike where we needed to shimmy along a plank secured against the side of a mountain face. Chains hung every 10 or so feet to hold on to as we scaled the side of the rock. We moved slowly and cautiously along the wooden plank handing the chains back and forth to each other. The sound of our collective breathing was the only sound for miles. We made it across. We laughed nervously among ourselves as we looked backward across our path, knowing that what we had just done was dangerous. We shuffled away from this and continued the hike. After miles, the trail cleared again and we reached the west peak. We were exhausted and dirty and moody as we arrived at the peak. We sat down and just stared. No one spoke, we didn’t have enough energy. We shared water because we were running out. We didn’t take any pictures because searching through our bags from cameras was too much to bear. We sat together, catching our breath and saving a mental image of the view. To this day, I remember this view more than any of the others even though there’s not a single picture to remind me. As much as taking pictures helps you remember where you’ve been, so many of the views from the Yellow Mountains of China cannot be accurately captured in photos. Some sights shouldn’t be shared. Keep them for yourself. And if the memories fade, perhaps it’s time to return. It was time to move on. We grabbed our backpacks and kept going. The last leg of the hike was quiet. We knew we had hit all the peaks, there was nothing left. We climbed in silence, each reflecting on our personal transformative experiences. When we reached the north peak people surrounded us again. We had barely seen anyone since we left the north peak the day before and we were all uncomfortable with all the noise. Some of us popped in headphones and listened to music to drown out some of the sound. I would recommend this. Coming back from the trek is overwhelming and easing yourself back into the crowds of people is easier if you’re listening to your favorite song. We quickly maneuvered through the crowd to get back to the cable car. We hopped in and collectively exhaled. “I can’t believe we did that, you guys,” said my friend. We all nodded and smiled, we couldn’t believe it either. Photos by Ian Armstrong and Madeleine Skaller.